TORONTO (Mar. 9) – If you’re wondering what may be required for the Leafs to end their playoff drought this spring, look no further than the calendar. When a year ends with the numeral 3, chances are there will be excitement in this city. In fact, No. 3 – in any circumstance – is good news. For half a century, pro sports teams in Toronto have fared rather nicely in the fourth year of a decade. It began in 1963 when the Leafs of Dave Keon, Tim Horton and Johnny Bower won their second in a string of THREE Stanley Cups. In 1973, Leafs acquired THREE of the greatest players in franchise history – drafting Lanny McDonald and Ian Turnbull, then signing Borje Salming as a free agent. The club improved that season by 22 points, thanks, in large part, to goalie Doug Favell: first-ever Leaf to wear – you guessed it – No. 33. There was lots to celebrate in 1983, as Toronto Argonauts won their first Grey Cup in 31 years and the baseball Blue Jays broke the .500 barrier for the first time with a splendid 89-73 record in their seventh Major League campaign. You may also remember that Dave Stieb was starting pitcher for the American League in the All Star Game at Comiskey Park. Maple Leafs captain Rick Vaive was in the midst of his THREE consecutive 50-goal seasons. Few sports fans in this city need a reminder of 1993, when Pat Burns and Doug Gilmour led the Leafs to within a game of the Stanley Cup final (a post-1967 team record) and the Blue Jays won their second consecutive World Series on Joe Carter’s “touch ’em all” home run at SkyDome against Philadelphia. John Olerud, Roberto Alomar and Paul Molitor finished one-two-THREE in American League batting that year. JOE CARTER OF TORONTO BLUE JAYS JUMPS FOR JOY AFTER WINNING THE 1993 WORLD SERIES AT SKYDOME WITH A WALK-OFF HOME RUN AGAINST PHILADELPHIA. In 2003, the Leafs finished with 98 points – tied for fifth-most in franchise history – while Toronto Rock won its second National Lacrosse League championship with a victory over Rochester Knighthawks. The following NHL season, which began in 2003, saw Pat Quinn and the Maple Leafs compile a club-record one-hundred-and-THREE points. Perhaps, then, it is no coincidence that in 2013 the Maple Leafs are enjoying a surprise renaissance and the Blue Jays have finally spent a glut of cash on established players, making them the odds-on favorite in Las Vegas to win the World Series. Argonauts, of course, are the defending Grey Cup champion, though the title game was played just more than a month before the new year. Still, the football club must have had the numeral-3 vibe. And, let’s not forget the two greatest Maple Leaf players of the past generation – Gilmour and Mats Sundin – wore jerseys ending in THREE: 93 and 13 respectively. Salming, the most prolific defenseman in Leaf history, wore No. 21. Add two and one and what do you get? Same with Roberto Alomar, the greatest of all Blue Jays, who wore No. 12. Am I having a bit of fun here? Of course I am. But, heck, our teams have bottomed out so regularly that fans can use any smidgen of hope. AFTER A RATHER UNEXPECTED SHOWING in the first half of the season, Leafs have earned the right to a moral victory, which occurred in Boston on Thursday. Though they lost to the Bruins – a shock equivalent to the sun rising each day – Leafs belonged on the same ice and revoked the memory of an 8-0 humiliation in their previous visit to TD Garden last March. One move I would have made is putting Mike Komisarek in the line-up. Yes, he’s played only four games this season and not since Feb. 2. Yes, if Leafs cannot trade him, they’ll use a compliance buy-out to annul the remaining two years of his contract. But, Komisarek has always shown up for games at Boston – invariably fighting his nemesis, Milan Lucic, and delivering the passion required for Leafs to overcome their plague against the Bruins. Komisarek had earned the chance to dress on Thursday. It appears, however, that – barring injury – he has played his last game for the Blue and White. I’D BE INTERESTED TO KNOW HOW Brian Burke feels about the Leafs a) overachieving in the first half of the schedule, and b) performing with the belligerence he coveted during his time here as general manager. On one hand, Burke should be very proud of the style Leafs are deploying, as he was responsible for hiring Randy Carlyle and accruing nearly every player on the team. Conversely, it must gall Brian to no end that his vision somehow materialized after being shown the door, rather abruptly, on Jan. 9. The contrast is palpable. On Friday night, Leafs-TV showed a game from Pittsburgh in December 2008. Though Leafs upset the Penguins, 7-3, it was a lovey-kissy affair, save for a blast along the boards by Toronto defenseman Jonas Frogren (remember him?) that briefly hobbled Evgeni Malkin and a fight with 2:22 left between Andre Deveaux (remember him?) and Ruslan Fedotenko. On that night, Burke had been GM for three weeks; Ron Wilson coach for three months. Leafs were crowded with passive bodies – Jason Blake, Niklas Hagman, Lee Stempniak, Tomas Kaberle, Anton Stralman, John Mitchell – and no-hitters piled up throughout the season. Ultimately, Burke moved out the docile figures he inherited and replaced them with the majority of those terrorizing the league this year. Had Leafs shown such mettle a wee bit earlier, perhaps the architect would still be in place. Losing, however, accommodates change rather easily. WHILE BURKE MADE A NUMBER OF GOOD MOVES, he blew a couple – and I’m not referring to the always-disputable acquisition of Phil Kessel. Hindsight (critical and relevant among GM’s in all sport) shows the blatant error of trading Jiri Tlusty to Carolina for Phillipe Paradis on Dec. 3, 2009. Though he’ll never be a star, Tlusty – drafted 13th overall by John Ferguson in 2006 – has become a dependable second and third-line winger in Carolina, scoring 17 goals in 79 games last year; 11 in just 23 games this season. Paradis appeared in all of four games with Toronto Marlies of the AHL and was involved in Burke’s second mistake (up to now). On June 30, 2010, Paradis went to Chicago along with Viktor Stalberg in a multi-player swap for Kris Versteeg, who had won the Stanley Cup with Blackhawks earlier that month. Big and versatile at 6-foot-3, 210 pounds, Stalberg scored 22 goals for the Hawks last season and is playing regularly (with 13 points in 25 games) on the Chicago juggernaut (21-1-3) this year. Clearly despondent with a losing team after his Cup run in the Windy City, Versteeg scored 14 goals in Toronto and Burke sent him to Philadelphia on Feb. 14, 2011 for first and third-round draft picks. The deal could work out for Toronto if Stuart Percy (Mississauga OHL) develops into a big-league defenseman; he was chosen with the first-rounder acquired for Versteeg. Otherwise, dealing Stalberg will have been a waste. 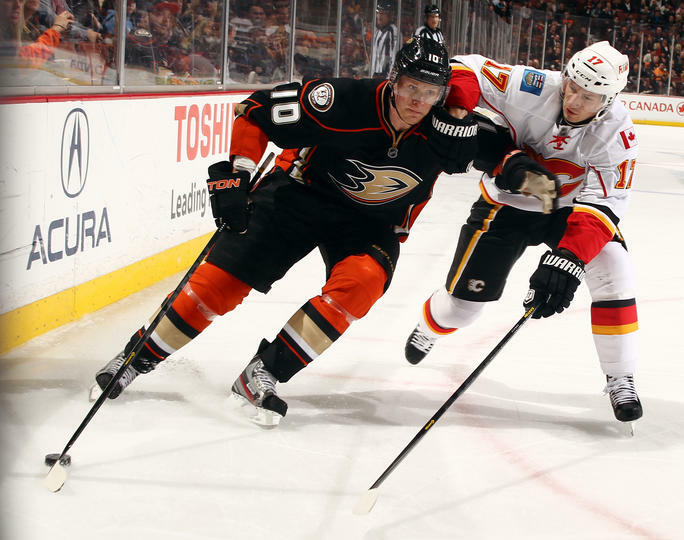 NOW THAT ANAHEIM HAS LOCKED UP Ryan Getzlaf on a long-term deal, the prevailing assumption is that pending free agent Corey Perry will be traded as a rental at the deadline – argument being the Ducks cannot afford to keep both their pillars. To me, that doesn’t make a whole lot of sense. All you have to do is look at the Chicago situation. After winning the Stanley Cup in 2010, the Blackhawks had a choice under the salary cap: Risk losing at least one of their Big Five (Patrick Kane, Jonathan Toews, Duncan Keith, Marian Hossa, Brent Seabrook) or dump second and third-level players. Ultimately, the Hawks chose Door No. 2, even though it cost the club four assets, including Dustin Byfuglien, who could have won the Conn Smythe Trophy with 11 goals and 16 points in the Stanley Cup run. Andrew Ladd, Brent Sobel and Ben Eager were also sacrificed. Chicago committed $102.2 million to secure Kane, Toews and Keith through the 2014-15 season, while already on the hook for $39.5 million to keep Hossa for the same length. Hawks then inked Seabrook for five years and $24.5 million. GM Stan Bowman knew his club would decline, but that filling holes cost-efficiently would allow his core players to fuel another contender. That plan – as the entire hockey world can attest – looks rather promising. Bob Murray, in Anaheim, should be paying attention. 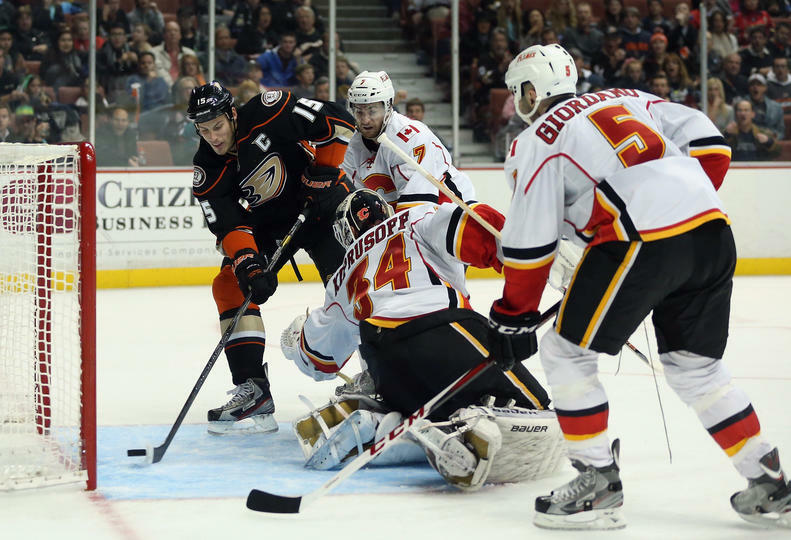 Though the Ducks do not procure the same gate-revenue as Chicago – which sells nearly 22,000 seats per game – the club is astounding observers with a 17-3-3 record for 37 points, second only to the Blackhawks. With lots of blue-line depth in the organization, and a come-from-nowhere goaltending star in Viktor Fasth (10-1-1, 1.92 GAA), Murray would be wise to keep his Big Three forwards: Getzlaf, Bobby Ryan and Perry. Ryan is under contract at just more than $5.5 million through 2014-15 and Murray just dropped nearly $25 million to secure Getzlaf through 2015-16. Perry won the Hart Trophy in 2011 after erupting for 50 goals and 98 points. He followed with 37 goals last season and is performing at a point-per-game clip this year. Anaheim has no chance of regaining its 2007 Stanley Cup form without the Peterborough, Ont. native. Given that a number of winning components are in place (and cheaper ones on the way), allowing Perry to leave will largely nullify the enormous commitment to Getzlaf. Just look at Chicago – and emulate the best team in hockey.